The Junior Symphony Orchestra will stage its second concert at the Lionel Wendt Theatre on November 2. The young musicians, ranging from the ages of 12 to 25, have received expert training under Maestro Ananda Dabare over the last eight months and will showcase their skills and love of music at this concert. Many young musicians are playing in the JSO for the first time. Performing in an orchestra has been a great experience for all of them and they have enjoyed the opportunity to “make music” together. The youngest member of the JSO, 12 year old Kavishka Paranavitana from Royal College, Colombo, says: “It is a fantastic experience to play with a lot of instruments and co-operate with others to make good music and it’s a great pleasure to work with a conductor like Ananda Dabare”. 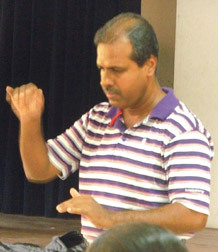 Ananda Dabare, who is both a Conductor and Leader of the Symphony Orchestra of Sri Lanka, has taken on the responsibility of training these young musicians with the intention of creating a pool of young musicians who will progress into the Symphony Orchestra of Sri Lanka. His expertise and experience has helped these young musicians into performing challenging classical works, which include Mozart’s Symphony No. 40 and the delightful Weber “Invitation to the Dance”. Under Ananda’s tutelage the young musicians have enhanced their own skills while learning ensemble playing, giving them all a great deal of enjoyment. Prashan Bastiansz is a 13 year old Trumpet player, who joined the JSO three months ago. He expressed his feelings as “I never thought I will be able to play for a JSO concert within three months. 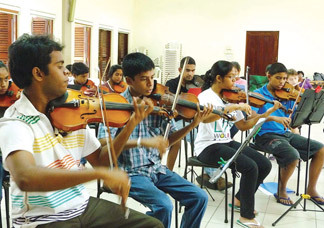 The JSO combines many young children who are playing in an orchestra for the first time with experienced young musicians who are already performing with the Symphony Orchestra of Sri Lanka. Their leadership and experience guides the younger children and gives them the confidence to play an orchestra. Vidurinda Samaraweera, a French Horn player from S Thomas, is 14 years old. This is his first experience of playing in the JSO and he states: “It is really a great pleasure to play in the Junior Symphony Orchestra and I feel very happy when playing with my friends in a well recognized musical combination. It feels great to play in an orchestra with great many players and I am very proud to be amongst them. Some of the young musicians who first played in the inaugural JSO concert in July last year have already graduated into the Symphony Orchestra of Sri Lanka. Sachiththa Fernando, a 17 year old from Ananda College, has already played with the SOSL since first playing for the JSO and enjoys the thrill of being a part of the main orchestra. The JSO concert is an opportunity for all young music students to see children of their own ages performing high quality orchestral music, which will inspire and motivate them to enhance their own skills. This concert is sponsored by the Royal Norwegian Embassy as part of their programme to enhance and develop musical skills through exposure and exchange of experience and to make high quality music accessible to all people.